How do I dim my Fluorescent lights? You are here: Home / FAQ / How do I dim my Fluorescent lights? Try our Exclusively designed dimmable tube guards. You can install the tubes over individual workstations so the entire room doesn’t need to work with a dimmed light output just for a few people’s preferences. Tube Guards (aka: Safety Sleeves, Tubeguards, Protect-A-Lamp, Lamp Shields, Tube Sleeves, Toob Gards) are common light bulb covers with plenty of specialty style options. Here we’ll discuss one of those specialty styles called Matrix Tube Guards. 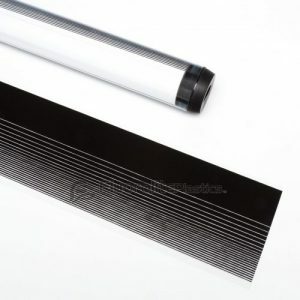 Our Exclusively Designed tube guards are clear tubeguards with graduated line patterned mylar sleeves inserted inside them. This sleeve allows for personal manipulation of the light. You can spin the tube guard around the bulb, dimming the light to your personal preference. As you rotate the Fluorolite tube guard you can see the shaded area rotates which allows more or less light out. This is a great way to dim your fluorescent lights without using an expensive dimming ballast. These work great on under the counter lights used in cubicles. Try Smoke tube guards for an economical way to dim the light output. Look at Retro-Fit kits, you can de-lamp, save energy, money and improve the ambient light.